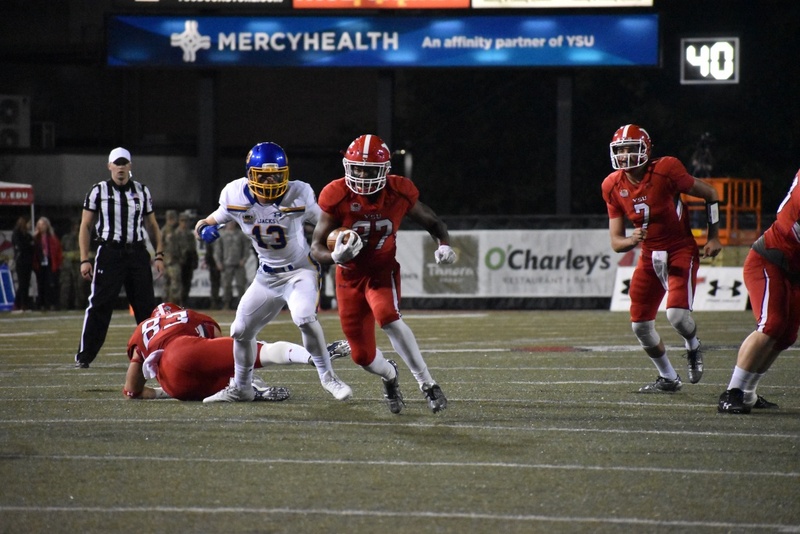 In a battle of top five teams on Saturday night, fifth-ranked Youngstown State University (3-1, 1-0 Missouri Valley Football Conference) hosted fourth-ranked South Dakota State University (3-1, 0-1 MVFC). YSU defeated SDSU 19-7. The Penguins had lost to the Jackrabbits in eight of the previous nine meetings. The game was the first at Stambaugh Stadium to feature both teams ranked in the Top-10 since 1997. SDSU turned the ball over after a Bryce Gibson strip of SDSU tight end Dallas Goedert was recovered by YSU safety Kyle Hegedus on the Penguins’ 6-yard line. Hunter Wells started at quarterback for the Penguins after recovering from a shoulder injury sustained in Week 2. However, Nathan Mays had to take over under center after Wells took a hit on the first drive. Mays picked up where he left off in Week 3 and ran it in for a touchdown on 4th down. The 4-yard run capped off a 16-play, 94-yard drive that put YSU up 7-0 with 3:05 left in the first quarter. YSU held the 7-0 lead at the end of the first quarter. The Jackrabbits opened up the second quarter with a 10-yard touchdown pass from quarterback Taryn Christion to wide receiver Jake Wieneke. The game was tied 7-7 with 14:15 left in the second quarter. The Penguins’ running attack punished SDSU on a 9-play, 75-yard drive that ended with a 1-yard touchdown run from running back Tevin McCaster who leaped over the goal line for the score. All 75 yards were gained on the ground and YSU led 14-7 with 10:02 left in the first half. The Penguins missed a big scoring chance as time ran out after McCaster failed to get out of bounds on a 3-yard pass from Mays at the end of the first half. YSU entered the locker room leading 14-7 at halftime. The Penguins lead the first half with 252 yards on 42 plays. The Jackrabbits finished the half with 182 yards from 28 plays. Mays remained in at quarterback for YSU in the second half as Wells was on the sideline in a sling. YSU failed to convert in the red zone once again as Mays was picked off by Lorenzo Williams on the 1-yard line with 4:39 to go in the third quarter. The Penguin defense quickly made up for the mistake on offense and stuffed the SDSU run in its own end zone. Linebacker Armand Dellovade was credited with the safety that put YSU up 16-7. The Penguins entered the fourth quarter with the ball and the lead. YSU continued to dominate the time of possession and knocked almost five more minutes off the clock before Zak Kennedy split the uprights on a 24-yard field goal. The Penguins led 19-7 with 10:21 left in the game. Dellovade made a major impact on the game once again when his interception halted a 6-play, 45-yard SDSU drive. After the game, Dellovade said he was attempting his best Kevin Rader impersonation on the interception. YSU ran the clock out to win the game. The Penguins increased its home win streak to 12 games and completed a ninth straight undefeated September. The Penguins dominated the time of possession with over 45 minutes on offense. McCaster ran for 183 yards on a career high 35 carries. 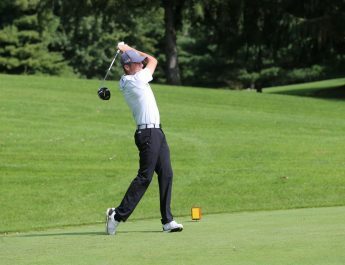 YSU will head west to take on University of South Dakota on Oct. 7 at 3:00 p.m.